Quick Contacts is the ultimate speed dialing application that you've been missing. 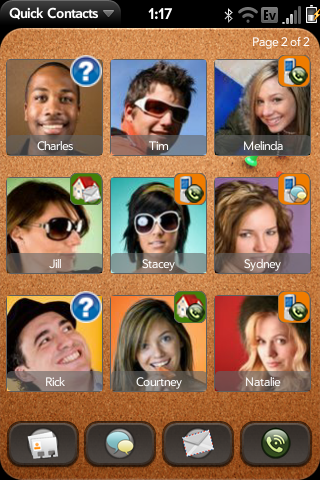 With Quick Contacts, you can call or SMS your favorite contacts with just a tap of their photo. Add your friend to Quick Contacts, tap on their hotspot and it will give you their details so you can choose their number to dial. Want it to be even quicker? Set up a preferred number for each contact and the next time you tap on their hotspot, Quick Contacts will take you straight to the dialer. And if your friend has a picture associated with them, their hotspot will be their picture. That will make calling your favorites very easy. Once you start using Quick Contacts, you'll wonder what took so long. If you find Quick Contacts to be useful and you feel like donating, it would be much appreciated. Palm requires all releases on PreCentral to now be beta versions for testing! This version will expire 14 days after you first use it unless you have donated at least $5 to receive free updates for life. Also, Check out our Quick Contact Facebook Fan Page and help support us by becoming a fan!